Feme: Prehistoric fisheries: learning about the past to inform the present and the future. Prehistoric fisheries: learning about the past to inform the present and the future. We are probably sounding repetitive by now, but fishermen’s tales can tell us a lot about how things were in the past. Still, there is a limit to how far back in time fishermen can go with their memories. They would not be able to tell us about things that happened thousands of years ago, right? Well, not exactly, past fishermen might still be able to communicate with us through other means, for example, through some physical evidence of what they were targeting in the past. We already know that fishing was practiced by very ancient civilizations (Fujita et al., 2016), which relied on limited technology. However, when we say “limited technology” we are simply comparing it with our current technology, which by no means implies that fishermen had no impact on their target stocks in the past. Assuming that they did impact, we still have to understand how their forefathers influenced the current patterns of diversity and abundance of marine species. Along the Brazilian coast, there are over 2,000 shellmounds with a high concentration of marine faunal remains, including fish components such as cranialbones, otoliths, teeth and others. These shellmounds can provide lots of information about prehistoric fisheries activities, including gears used, types of fishing ground,species diversity and even some evidence of overexploitation. That is what Lopes et al., (2016) have investigated in their study "The Path towards Endangered Species: Prehistoric Fisheries in Southeastern Brazil”. Remains of 13 shellmounds ranging from 8,720 to 985 years calibrated before present (cal BP) from the southern coast of the state of Rio de Janeiro were analyzed. Patterns of similarity between shellmounds based on fish diversity, ages of the assemblages, littoral geomorphology and prehistoric fishing were identified. The results showed a well-developed prehistoric fishing activity, with 97 marine species identified. Such species represent 37% of all modern species (i.e., 265 spp.) that have been documented along the coast of Rio de Janeiro state. 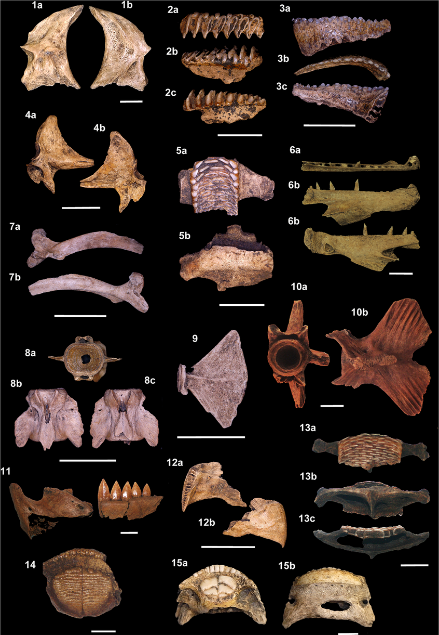 Figure from Lopes, et al., 2016: Teleostean skeletal remains from the Rio de Janeiroshellmounds. (1a-b) Scarus sp., anguloarticular, Algodão, MNUFRJ-ZA-496, and (2a-c) pharyngeal tooth, Acaiá, MNUFRJ-ZA-724. (3a-c) Sparisoma sp., dentary, Acaiá, MNUFRJ-ZA-720, and (4a-b) angulo-articular, Acaiá, MNUFRJ-ZA-666. (5a-b) Scarus sp., lower pharyngealtooth plate, Acaiá, MNUFRJ-ZA-674. (6a-c) Trichiurus lepturus, dentary, Acaiá, MNUFRJ-ZA-746. (7a-b) Katsuwonus pelamis, maxillary, Acaiá, MNUFRJ-ZA-705, and (8a-c) vertebrae,Acaiá, MNUFRJ-ZA- 710. (9) Scomberomus sp., hypural complex, Acaiá, MNUFRJ-ZA-701. (10a-b) Istiophorus albicans, hypural. Many species that are currently main targets, such as snappers, groupers and tunas, were already being targeted by prehistoric fishermen. However, their main targets used to be sharks, rays and finfishes in productive areas influenced by a coastal marine upwelling. The presence of adult and neonate shark (including even great whites! ), especially oceanic species, is interpreted as evidence of prehistoric fishing capacity of exploitation of nursery areas. The data also brought some novel and stronger evidence of our selective pressure on fish size. Whitemouth croaker records have shown, for instance, that this species is now about 28% smaller in comparison to the period of when such shellmounds were formed. The tale that such ancient fishermen are telling us might be one of early over-ormisguided exploitation, perhaps much earlier than our “shifting baseline” minds have been telling us in the last decades. By discovering all we can about the past, perhaps we can understand our present exploitation pattern a little better and infer what the future has in store for us, promoting further, deeper and more meaningful debates about changes we have caused and continue to cause in our oceans. Fujita, M., Yamasaki, S., Katagiri, C., Oshiro, I, Sano, K., Kurozumi, T., Sugawara, H., Kunikita, D., Matsuzaki, H., Kano, A., Okumura, T., Sone, T., Fujita, H., Kobayashi, S., Natuse, T., Kondo, M., Matsuura, S., Suwa, G., Kaifu, Y. 2016. Advanced maritime adaptation in the western Pacific coastal region extends back to 35,000–30,000 years before present. PNAS. Lopes, M.S., Bertucci, T.C.P., Rapagnã, L., Tubino, R.A., Monteiro-Neto, C., Tomas, A.R.G., et al. 2016. The Path towards Endangered Species: Prehistoric Fisheries in Southeastern Brazil. PLoS ONE 11(6): e0154476.